When they left the garden, I closed the gate behind them, even though there was no need. It was a gesture like the cherubim and flaming sword—for my sake rather than theirs, as I knew before they departed that they would never come back to stay. They’d cherish it in their memories, and visit from time to time as their busy adult lives allowed. But never again would it be their home. They’d chosen to grow up, which is how I’d meant it to be. Still, when they departed, I wept. Tears of sorrow, tears of joy—like those of any parent when a beloved child leaves home. My tears fell as rain, soaking the earth, splashing in the river that Adam and Chava followed downstream out of the garden. As night fell, a chill set in. Rain turned to the first snow, as pure and white as the vestments of this sacred season, as the waxing moon rising in the darkening sky. Adam and Chava took shelter in a cave beside the riverbank. They held each other closely, for warmth and comfort and love. When, at last, the snow stopped, they stepped out and spied their reflections dancing over the surface of the stream, mingling with water and moonlight. Avinu malkeinu chaneynu v’anaynu ki ayn banu ma’asim. . .
Have mercy on us, they chanted—be gracious, and show us your abiding kindness. Then, moved to my core by their brave music in the night, I sang, too. In a still, small voice—the faintest whisper on the wind—I sang with them, asking their mercy and forgiveness as they had pleaded for mine. And so we sing, here, tonight. through the evening’s closing gates and into the beckoning world. After tasting the fruit, we felt strong and proud. As Chava told you last night, we did not eat until we’d carefully considered the consequences, to the best of our knowledge and ability. Although we disobeyed, we believed—and still believe—we did what Yah desired of us. But as it turns out, no matter how well you weigh a decision beforehand, you cannot grasp its full import until after the fact. As the momentary exhilaration of eating the forbidden fruit wore off, fear and despair seeped in. With opened eyes, we became aware of things we’d never discerned before: lowering light, lengthening shadows, burnt orange leaves falling from the heretofore verdant trees. We noticed the mushrooms on the forest floor, feeding on decay. We watched the earthworms transform dead waste into new soil. And we knew in our hearts and felt in our bones, that one day, we, too, would be food for worms and fungi. We would return to the clay from whence we came. Death became palpable, and the pang of leaving the only home we’d ever known grew almost unbearable. We’d consciously opted for adulthood, but having grown up overnight, with a single bite from the Tree of Knowledge, we found ourselves in way over our heads. That’s when we realized that we were naked. As we watched the creatures swarming around us, we saw they all possessed protective layers to guard against the mortal world: shells and scales, fur and feathers, insects’ exoskeletons and amphibians’ slime. Whereas we, with our paltry hair and thin skin, stood utterly exposed. After we tasted from the Tree, our vulnerability overwhelmed us; the least we could do was cover ourselves. So we girded our loins with fig leaves, then hid beneath the heavy brush lining the riverbanks. All the while we recognized we were making a very big mistake. Of course it was foolish to pretend we could hide from Yah, or even wish to do so. We knew better than to flee from our Creator. But our faith faltered. Our courage waned. We lost our nerve. Then, as now, our failures came not from lack of knowledge but from fear, confusion, and want of will. But the words didn’t come. Chava and I held our breath, in uneasy silence. Worst of all, when a deeply disheartened Yah finally called us out and confronted us, we dumped our accumulated fear and self-loathing onto one another. I blamed Chava. She blamed the snake. And then we blamed each other. Because we failed to own up to our deeds, our brave act of eating degraded into something shameful. My children, Yah still asks that question of each and every one of you: Ayekka? Where are you? On this sacred day, I implore you: Be present to that voice. Listen for the questions. Live in them. Make your misdeeds the measure of your growth. And do not believe the fear-mongers who preach of thorns and thistles and childbirth’s pain as divine retribution. Those challenges, like our exile from Eden, are a painful but necessary part of the plan. Yah didn’t really rebuke the serpent either; why would Yah chastise him for doing Yah’s own bidding? Consider the way that snakes still move with such extraordinary grace—winding over the earth we love—and you will know that serpent did not lament losing his legs. 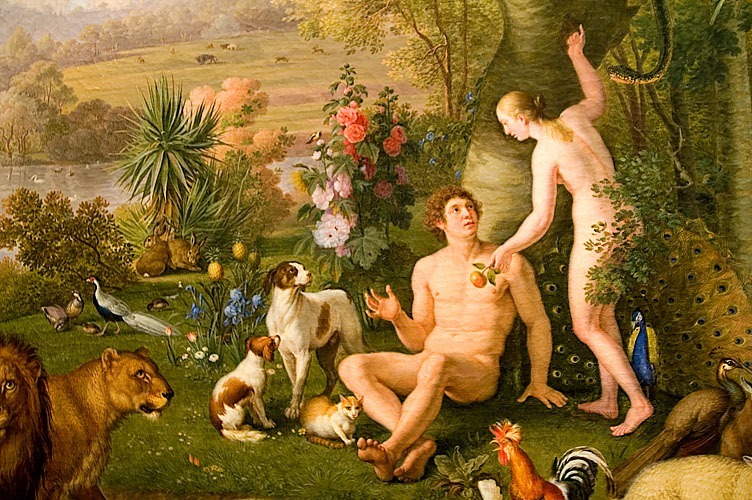 Everything that unfolded in Eden was about consequences rather than punishment. Its moral is the price we willingly pay to live as adults. For as I’ve aged, I have learned that Yah’s will is sustained by order and chaos alike. And mature knowledge is, by definition, born of both, the fruit of experience and travail. My children, as I speak to you now, the vivid late morning light still shines bright upon us. But by the time the sun sank low that first Yom Kippur evening, I assure you, Yah had fully forgiven us. Our exodus from Eden was an act of grace, without a trace of anger. We departed with Yah’s blessing at ne’ilah, the Hour of the Closing of the Gates. At that same hour later tonight, we will take our leave of you for this sacred season. Our tale will be set aside, as all stories must be—and your work will begin in earnest. Meanwhile, Chava and I both wish you all a strong and reflective fast that leads you deeper into the adulthood you desire. G’mar chatimah tovah—may you be sealed for blessing in Yah’s Book of Life. Our first Yom Kippur began in the garden and ended in the outside world. Over the course of that very long day, we ate and opened our eyes and hid and forever left our childhood home. My children, on Rosh Hashanah, Adam and I shared our story of young love; today we recall our first tentative steps toward maturity—how we struck out into uncharted territory, both knowingly and entirely without a clue. It’s a tale of defiance and destiny, mortality, fear and courage. And of making one mistake after another. In other words, our Yom Kippur story is about growing up—a task in which we both failed and succeeded—just like you. Tonight I’d like to reclaim and retell this tale because, over the ages, many who purport to honor our legacy have warped it beyond recognition. They refer to our exile from Eden as the Fall, and portray our choices there as the root of all subsequent sin and suffering. Mostly, awash in centuries of misogyny, they blame me. So let me be clear from the outset: Adam took the fruit of his own free will, and given the opportunity to revisit that fateful day, both of us would eat it again, without a moment’s hesitation. In the aftermath of our decision, we failed badly. We panicked and diminished ourselves. But we didn’t fall, or condemn our descendants to repeat our failures. There is no one original sin; everyone makes their own mistakes and must take responsibility for them. We are all obliged to learn from our own misdeeds. Our critics also misconstrue the serpent’s role. They demonize him as a satanic tempter. But I wasn’t seduced—I knew I’d eat from the Tree the moment I saw it, long before I met him ambling through the grass. I didn’t need the snake to pique my hunger for the Knowledge of Good and Evil. My appetite was fueled by the innate yearnings Yah created in me. I learned that we humans are creatures of desire, longing to shape the world through our own choices. After the drama of our first day together, life soon grew dull for Adam and me. In the beginning, the garden seemed so immense—wild and alive, inexhaustible by day and by night, terrifying. But now, nine days later, it was starting to feel a little small. The verdant lawns and orchards never changed; even the rivers’ flow, like the always-perfect weather, remained remarkably, flatly constant. Our calling—to work and watch over the place—became tame and tedious. We did our duty—exploring the terrain, tending the plants, playing with the animals—but with each passing day, the exercise rang more and more hollow. That time was like an all-expenses-paid vacation, where you relax on a white-sand beach with exquisite food and drinks and not a care in the world—until, after a week or two, you wake up and realize you are eager to get back to work. For while we all like to visit Paradise, you can’t really live there. In the perpetual safety and security of garden life, I was losing my sense of curiosity and wonder. I surmised that if we didn’t do something soon, I might never again experience the kind of freedom I desired so dearly. I was learning that a meaningful life requires risk—that human liberty is impossible in a changeless world, and change always entails living with loss. I wanted my freedom. I longed, above all, to grow up. As young as I was that first Yom Kippur, I knew there must be something more, beyond the gates of Eden, and the only way toward it was to eat the fruit of Knowledge of Good and Evil—even if that meant that one day we would die. And though, like any child, I did not fully understand, I sensed that to create that kind of meaningful life, I needed the dark hug of time. So when the serpent came to me, under the shade of that forbidden tree, I took comfort in his presence. He truly was the most cunning of all of Yah’s creatures—more than that, I realized, he was Yah’s special agent on the ground. His voice was Yah’s—expressing the wild, chaotic side of Yah that did not obey the ostensible rules. As he spoke, it dawned on me that the whole drama playing out before my eyes was a set up. Yah wanted us to take the fruit—that’s why it was sitting so prominently in the center of the garden. For as every parent knows, if the intention is to keep the kids out of the cookie jar, you hide it; you certainly don’t put it in the middle of the room and point it out repeatedly before leaving the house. Yah couldn’t wait for us to disobey, knowing that was the only way we could launch our journey to adulthood. Indeed, I think that on that fateful morning, Yah was also ready for a change. They say that Yah created us, humankind, because Yah loves stories. Well, in a world without good and evil, devoid of both ethics and mortality, the plot quickly runs thin. How wearying it must have been for Yah those first few days, watching for a show of chutzpah, waiting for the one decisive act to set in motion the whole messy, tragic, comic and endlessly interesting human future. And so I reached for the fruit—for Yah and for us. I was not naïve. I—who had so adamantly resisted Adam’s naming everything in the garden because it needlessly separated and divided one thing from another—I willingly brought on the most irrevocable divide of all. My choice, duly considered and freely made, imposed an unbreachable divide between childhood in Paradise and maturity in the mortal world. Yes, my children, I ate—as aware of the consequences as I could be. It wasn’t an apple, as legend would have it. Nor was it a grape or a fig or a giant sheaf of wheat, as some of the Rabbis would later suggest. It was a fruit like no other, unique in the world—at the same time sweet and bitter, delicious and disgusting, sickening and healing, evil and good—which is to say it tasted like everything and like nothing else—like life itself. I held it out for Adam. He hesitated, understandably afraid of losing everything he’d so carefully considered and named. Contrary to the rumors you may have heard, I did not tempt or cajole him. I respected his reticence. I simply placed the fruit in the palm of his hand and affirmed that the choice was his. He nodded his thanks. And then, like me—with me—he made the complex, difficult choice. He chose adulthood. He raised the forbidden fruit to his lips and bit off love and discord, exile and death and desire. Our eyes opened to freedom, with its dazzling array of pitfalls and possibilities. We smiled at one another and stood tall, side by side. Then Yah knew that we had eaten. . . and saw that it was good, lamenting and rejoicing at our disobedience. And so, my children, it has been in every generation since. We disobey. We suffer loss. We diverge from our parents’ paths to seek our own—and in so doing, recreate ourselves. It’s heartbreaking and essential, this expulsion from childhood’s garden. We don’t want to depart, but know we must. We leave home. We weep. We celebrate. Yah leaves and weeps and celebrates with us. Oh, my children, if only our Yom Kippur story ended there. . . Up to that point, we’d done everything this sacred day demands. We’d wrestled with our consciences, weighed our choices, nurtured one another, listened for Yah’s voice. We dared to be vulnerable together, mustered the courage to confront and ultimately accept our mortality. We embraced the terrible beauty of time and love and loss. But alas, before day’s end, we did one more very human thing that almost undermined it all. My children, you know the experience or you wouldn’t be here this Yom Kippur. We cowered from ourselves and Yah. Alas, it wouldn’t be the last time. From the moment we met, he spoke more than he listened. He was nervous, and considering how long he’d lived alone, I couldn’t really blame him for his lack of social skills. Still, he just went on and on about how neatly he had named and ordered everything, before he’d even introduced himself or asked how I was feeling. Mind you, I wasn’t ungrateful for what he’d done—I know all that arranging was hard work. But I’m getting ahead of myself. On this Rosh Hashanah morning, when we celebrate creation, I’d like to tell you my story, which is also his—and yours. Consider it a gentle plea for chaos. When we first met, he seemed truly happy to see me. I could tell how lonely he’d been, how grateful he was for my company. And I, newly born, had so many questions for him—about that marvelous garden that was to be our home, its myriad strange and lovely inhabitants, and the Creator that made us, who he called Yah. But Adam didn’t have time for any of that—or so he told me as he labeled everything in sight. He was so dead set on the task at hand, so intent and serious—while to me, the whole endeavor felt. . . arbitrary. In an effort to make conversation, I’d ask: “Adam, what do you call this and this and that?” Irritated by the interruption, he’d reply curtly: “Evven. Orev. Shemesh.” Silently I wondered: Why? Why not stone? Raven? Sun? Or piedra. Cuervo. Sol. Or, more to my liking, heavy-silence and dark laughter and gold-that-warms-my-face? All those names of his! So capricious, and worse—such abstractions, like pale shadows of the tangible things they purported to name. While he was categorizing everything into order, genus and species, I wanted to learn the stories of this gnarled oak, that fox running through the undergrowth, this crimson-mottled rose growing along the riverbanks. I realized that for me, knowing happened in relationship—as I experienced and connected with particular places and things. I couldn’t tolerate the way Adam’s names and orders separated us from the rest of creation I so dearly longed to be a part of. Maybe some of this was biology; without the pull of moon or womb, milk or menopause, he was more inclined to separate himself from everything else, to imagine himself like Yah, to forget that he was made of clay. Whatever the reason, while he was busy apportioning the garden, I was determined to push the boundaries. To connect. To occupy the liminal spaces where borders blurred and I felt most alive. As he cleaned up, I embraced messes. While he sorted everything by time and season, dividing between light and dark, holy and profane, I sought to love and hate and laugh and cry, to arrange and confuse, forgive and remember and forget—all at once. I sought out the magical, mystical, mixed up places that had safely escaped the Great Separations: dawn and dusk and fog, marshes and mudflats. On occasion, I, too, made use of walls; like Adam, I sometimes cherished a room of my own. But even then, always I wanted it with windows flung open to the wild and entangled world. “Adam,” I pleaded, “your binaries are for math, not life. Some things—the best and most important things—don’t fit neatly into boxes. They lay claim to multitudes of names, bestowed by nature and nurture, accident and fate—and refuse in earnest to be defined by any of them. Those names are not the end of knowing but its beginning. Knowing another is endless; the thing to be known grows with the knowing. Look closer at the rivers you have used to mark this marvelous place. Where you see borders, I find confluences, the mingling of life-sustaining waters. 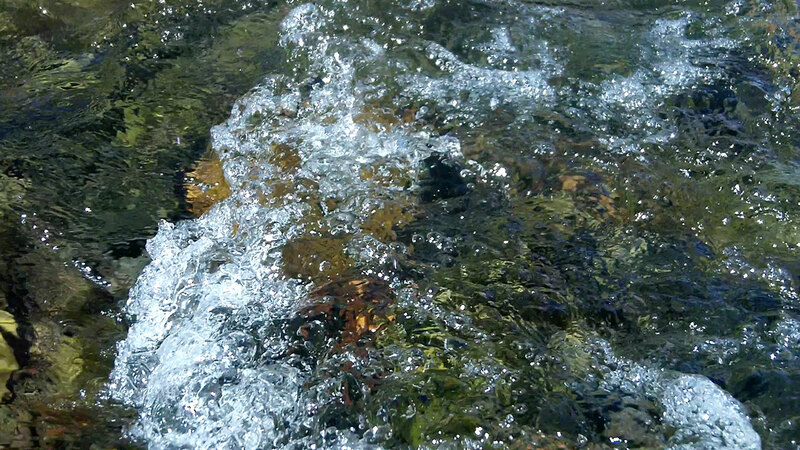 See how the stream loves chaos, how it loops and meanders, never running straight. I would like to walk those winding riverbanks with you, using our speech to make connections. Let’s explore this garden side by side. We can celebrate its wildness, listen to its stories, and create our own, together. I have never felt so lonely as I did in that moment. Part of me wanted to just let it go, to appease him in his anger. But I was not born to submit. Yah created me to be ezer k’negdo, a partner to lovingly challenging him. I was stunned—too flustered to help him, too proud to acquiesce—and so I turned away. I walked alone, upstream, until I made it back to the rivers’ source at the center of the garden. There I took refuge beneath the enormous tree that he’d so adamantly insisted I avoid. I sat, silent and solitary, for what seemed a very long time, until I slept. When I awoke, the sun was gone. Everything was black. My first night had fallen, and all that I’d experienced during the day was unrecognizable, shrouded in shadows. As my eyes slowly adjusted, I glimpsed the heavenly hosts sprayed across the sky, but their light, though shimmering, made me feel small and cold and afraid. I shivered. The night went on and on. The stars wheeled overhead. I wept. Then, in that hour of deepest darkness, something shifted in me. I began to feel for Adam—to feel with him. With tears flooding my broken heart, it dawned on me that his impulse to control creation’s wildness was not born of arrogance or contempt, as I had thought. I realized we were more alike than I’d imagined—that he, too, was terrified. I wept and waited that first night, exposed and lonely—as he must have so often been before I was born. In my fear, the desire to name and contain my surroundings gripped me, too. Adam’s ardor for order offered the illusion of control, and when my vulnerability felt too much to bear alone, it dearly tempted me. So I sat, torn between fear and delusion, when Yah finally spoke to me. Like my partner, I first heard the call through the sound of my own breath: a rhythm, a release, a soft melody swelling through the night. I make peace and chaos, too. Surrender and take comfort, knowing you are dust and ashes. Let there be wildness, within and without. Yah’s voice brought the solace of surrender. My fear did not disappear, but alongside it, I felt a rush of courage and consolation that lifted my spirits. A warm presence enveloped me—it was Yah and then, seamlessly—miraculously—it was Adam, too, returned to me through the long night. He wrapped his arms around me, embraced me, kissed me for the first time. His cheek felt hot and wet against mine. He’d been crying, too. We sat together holding hands, weeping and laughing and sharing our stories until the sun peaked out of the east. And so, my children, in the end, my gentle plea for chaos turns out to be a love song after all—the world’s first love song. Perhaps that is what we celebrate most on Rosh Hashanah, this day when we are all born anew. Today we fall in love, again, with creation and its grandeur—even if it doesn’t always love us back. We use our halting language and mortal words to fall in love, again, with one another—our communities and friends and families, our parents and children and partners. We fall in love again, despite our fear, knowing full well that pain and heartbreak will inevitably follow. We fall in love again with Yah, who remains both deeply intimate and utterly inscrutable. Yes, as my husband reminded you last night, this is a season to make accountings. We recall our failings. We name and number our mitzvahs and misdeeds in the ledger of the year gone by. But beyond all that, I believe that the reason we really come to shul on this New Year’s Day is so that we might learn, together, to love what we would otherwise, naturally fear: our own human frailty. Avinu malkeinu, we plead, chanaynu v’anaynu, ki ayn banu ma’asim. Have mercy on us, show us your grace—for we are nothing before You. We come here, with compassion for ourselves and one another, to acknowledge our vulnerability, to hold and nurture and love each other, and in so doing, face down the fear together. On Rosh Hashanah, we celebrate creation by consoling and comforting one another. There is an antiseptic tidiness that characterizes a well-controlled gardener. And I’d go further and say that usually the gardener is male. Men seem more obsessed with order in the garden than women. . . So when I make a plea for havoc, what would be lost? Merely the pristine appearance of a garden kept highly manicured, which could be squandered for amiable disorder. Just in some places. Just to give a pull at our primeval senses. A mild desire for amorphous confusion which will gently infiltrate and, given time, will one day set the garden singing. I could only connect with particular things: As Franciscan friar Richard Rohr notes: All things are endowed with “this-ness.” A personal, unique God makes a personal, unique creation. I form light and create darkness: see Isaiah 45:7. I believe that rah, which is often translated as “evil” is better represented as “chaos”—the opposite of shalom, which, here, implies order and harmony.